When Steve Miller and Richard Sinclair departed Caravan following the release of Waterloo Lily in early 1972, with Pye Hastings’ discovery of new boy Geoffrey Richardson, the touring line-up was completed by Stuart Evans on bass and the well travelled Derek Austin on keyboards. 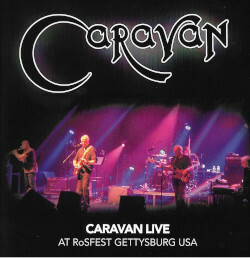 No album was released by this line-up of Caravan, although they toured extensively. While on the 1972 December tour in Paris, Caravan recorded this performance of ‘The Love in Your Eye’ for Rockenstock (broadcast January 2nd 1973) with a work in progress version of the finale from ‘Memory Lain, Hugh’ providing a suitable introduction and outro. 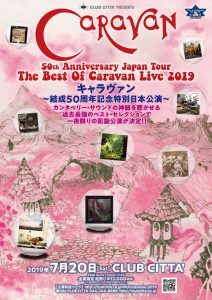 Interestingly the network doubled Caravan’s performance with a one off pairing of the original Hatfield and the North lineup (featuring Caravan’s recently departed Dave Sinclair) with guest vocalist Robert Wyatt. These two experimental line-ups were not to last, with Dave departing Hatfield almost immediately after the recording and Derek and Stuart departing Caravan after the early 1973 tour. ‘Rockenstock’, ‘Rock En Stock’ and the video source are © Institut National de l’Audiovisuel. All rights reserved (http://www.ina.fr). ‘The Love In Your Eye’ © Decca Music Group. All rights reserved. This entry was posted in TV Appearance, Videos and tagged 1972, France, TV on June 21, 2012 by caravan.